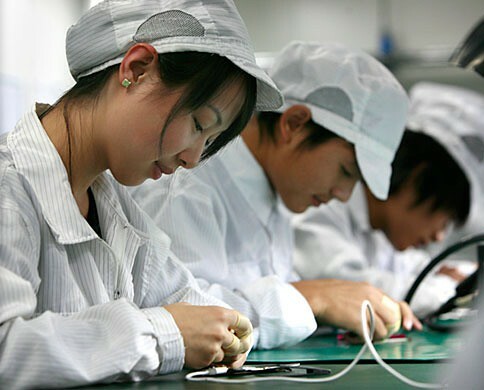 Basically, Apple is said to invest in the construction of factories in order to obtain exclusive rights to the output of that factory for a set period of time. Tim Cook hinted that was the case in a conference call this January where he announced that Apple has entered into secret long term component supply contracts worth $3.9 billion over the next two years. "On the operational side of house," Cook stated, "we've historically entered into agreements with others to supply; largest one was with flash memory suppliers back in 2005 that totaled over a $1 billion, because flash would become increasingly import across product line and industry." 1. Apple has access to new component technology months or years before its rivals. This allows it to release groundbreaking products that are actually impossible to duplicate. Remember how for up to a year or so after the introduction of the iPhone, none of the would-be iPhone clones could even get a capacitive touchscreen to work as well as the iPhone's? It wasn't just the software - Apple simply has access to new components earlier, before anyone else in the world can gain access to it in mass quantities to make a consumer device. One extraordinary example of this is the aluminum machining technology used to make Apple's laptops - this remains a trade secret that Apple continues to have exclusive access to and allows them to make laptops with (for now) unsurpassed strength and lightness. 2. Eventually its competitors catch up in component production technology, but by then Apple has their arrangement in place whereby it can source those parts at a lower cost due to the discounted rate they have negotiated with the (now) most-experienced and skilled provider of those parts - who has probably also brought his production costs down too. This discount is also potentially subsidized by its competitors buying those same parts from that provider - the part is now commoditized so the factory is allowed to produce them for all buyers, but Apple gets special pricing.